IC-7300 tax selling price ¥ 128,000! Reservations accepted start! If CQ ohm, as a reservation privilege, Original Screen Protector gift! Since the new product of this spec is this price, this is going to be a great sales! I think that it is very good value! From today, we will officially start accepting reservations. [With regard to delivery;Counting from 12/7 has been released and the announcement within 40 days, but the stock number is not known. Order to become a form of sequential shipping to the reservation, it is not possible to inquiries of the exact delivery date. Please please acknowledge. Even if it was booked, this year and, when it is not able to guarantee the delivery date that forever .... Please please acknowledge. [With regard to the timing of payment]As soon as goods in stock, we will send the guide mail of arrival by e-mail. Payment, is fine after that e-mail. 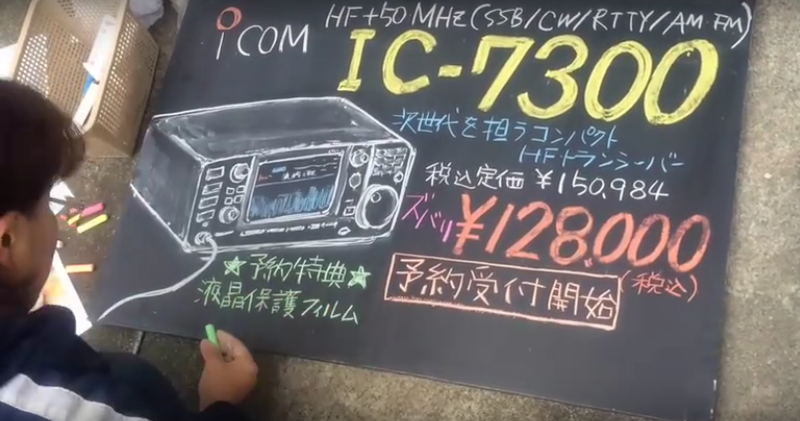 IC-7300 tax selling price ¥ 128,000! Reservations accepted start! Selling Price is in Japanese Yen.